The schools of management thought are theoretical frameworks for the study of management. Each of the schools of management thought are based on somewhat different assumptions about human beings and the organizations for which they work. Since the formal study of management began late in the 19th century, the study of management has progressed through several stages as scholars and practitioners working in different eras focused on what they believed to be important aspects of good management practice. Over time, management thinkers have sought ways to organize and classify the voluminous information about management that has been collected and disseminated. These attempts at classification have resulted in the identification of management schools. Disagreement exists as to the exact number of management schools. Different writers have identified as few as three and as many as twelve. Those discussed below include (1) the classical school, (2) the behavioral school, (3) the quantitative or management science school, (4) the systems school, (5) and the contingency school. 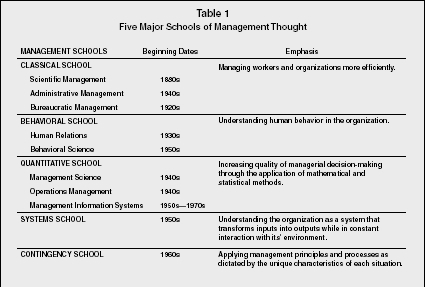 The formal study of management is largely a twentieth-century phenomenon, and to some degree the relatively large number of management schools of thought reflect a lack of consensus among management scholars about basic questions of theory and practice. CLASSICAL SCHOOL Managing workers and organizations more efficiently. BEHAVIORAL SCHOOL Understanding human behavior in the organization. QUANTITATIVE SCHOOL Increasing quality of managerial decision-making through the application of mathematical and statistical methods. SYSTEMS SCHOOL 1950s Understanding the organization as a system that transforms inputs into outputs while in constant interaction with its' environment. CONTINGENCY SCHOOL 1960s Applying management principles and processes as dictated by the unique characteristics of each situation. schools in more detail. In addition, three contemporary management perspectives are discussed. The classical school is the oldest formal school of management thought. Its roots pre-date the twentieth century. The classical school of thought generally concerns ways to manage work and organizations more efficiently. Three areas of study that can be grouped under the classical school are scientific management, administrative management, and bureaucratic management. In the late 19th century, management decisions were often arbitrary and workers often worked at an intentionally slow pace. There was little in the way of systematic management and workers and management were often in conflict. Scientific management was introduced in an attempt to create a mental revolution in the workplace. It can be defined as the systematic study of work methods in order to improve efficiency. Frederick W. Taylor was its main proponent. Other major contributors were Frank Gilbreth, Lillian Gilbreth, and Henry Gantt. Scientific management has several major principles. First, it calls for the application of the scientific method to work in order to determine the best method for accomplishing each task. Second, scientific management suggests that workers should be scientifically selected based on their qualifications and trained to perform their jobs in the optimal manner. Third, scientific management advocates genuine cooperation between workers and management based on mutual self-interest. Finally, scientific management suggests that management should take complete responsibility for planning the work and that workers' primary responsibility should be implementing management's plans. Other important characteristics of scientific management include the scientific development of difficult but fair performance standards and the implementation of a pay-for-performance incentive plan based on work standards. Scientific management had a tremendous influence on management practice in the early twentieth century. Although it does not represent a complete theory of management, it has contributed to the study of management and organizations in many areas, including human resource management and industrial engineering. Many of the tenets of scientific management are still valid today. Administrative management focuses on the management process and principles of management. In contrast to scientific management, which deals largely with jobs and work at the individual level of analysis, administrative management provides a more general theory of management. Henri Fayol is the major contributor to this school of management thought. Fayol was a management practitioner who brought his experience to bear on the subject of management functions and principles. He argued that management was a universal process consisting of functions, which he termed planning, organizing, commanding, coordinating, and controlling. Fayol believed that all managers performed these functions and that the functions distinguished management as a separate discipline of study apart from accounting, finance, and production. Fayol also presented fourteen principles of management, which included maxims related to the division of work, authority and responsibility, unity of command and direction, centralization, subordinate initiative, and team spirit. Although administrative management has been criticized as being rigid and inflexible and the validity of the functional approach to management has been questioned, this school of thought still influences management theory and practice. The functional approach to management is still the dominant way of organizing management knowledge, and many of Fayol's principles of management, when applied with the flexibility that he advocated, are still considered relevant. Bureaucratic management focuses on the ideal form of organization. Max Weber was the major contributor to bureaucratic management. Based on observation, Weber concluded that many early organizations were inefficiently managed, with decisions based on personal relationships and loyalty. He proposed that a form of organization, called a bureaucracy, characterized by division of labor, hierarchy, formalized rules, impersonality, and the selection and promotion of employees based on ability, would lead to more efficient management. Weber also contended that managers' authority in an organization should be based not on tradition or charisma but on the position held by managers in the organizational hierarchy. Bureaucracy has come to stand for inflexibility and waste, but Weber did not advocate or favor the excesses found in many bureaucratic organizations today. Weber's ideas formed the basis for modern organization theory and are still descriptive of some organizations. The behavioral school of management thought developed, in part, because of perceived weaknesses in the assumptions of the classical school. The classical school emphasized efficiency, process, and principles. Some felt that this emphasis disregarded important aspects of organizational life, particularly as it related to human behavior. Thus, the behavioral school focused on trying to understand the factors that affect human behavior at work. The Hawthorne Experiments began in 1924 and continued through the early 1930s. A variety of researchers participated in the studies, including Clair Turner, Fritz J. Roethlisberger, and Elton Mayo, whose respective books on the studies are perhaps the best known. One of the major conclusions of the Hawthorne studies was that workers' attitudes are associated with productivity. Another was that the workplace is a social system and informal group influence could exert a powerful effect on individual behavior. A third was that the style of supervision is an important factor in increasing workers' job satisfaction. The studies also found that organizations should take steps to assist employees in adjusting to organizational life by fostering collaborative systems between labor and management. Such conclusions sparked increasing interest in the human element at work; today, the Hawthorne studies are generally credited as the impetus for the human relations school. According to the human relations school, the manager should possess skills for diagnosing the causes of human behavior at work, interpersonal communication, and motivating and leading workers. The focus became satisfying worker needs. If worker needs were satisfied, wisdom held, the workers would in turn be more productive. Thus, the human relations school focuses on issues of communication, leadership, motivation, and group behavior. The individuals who contributed to the school are too numerous to mention, but some of the best-known contributors include Mary Parker Follett, Chester Barnard, Abraham Maslow, Kurt Lewin, Renais Likert, and Keith Davis. The human relations school of thought still influences management theory and practice, as contemporary management focuses much attention on human resource management, organizational behavior, and applied psychology in the workplace. Behavioral science and the study of organizational behavior emerged in the 1950s and 1960s. The behavioral science school was a natural progression of the human relations movement. It focused on applying conceptual and analytical tools to the problem of understanding and predicting behavior in the workplace. However, the study of behavioral science and organizational behavior was also a result of criticism of the human relations approach as simplistic and manipulative in its assumptions about the relationship between worker attitudes and productivity. The study of behavioral science in business schools was given increased credence by the 1959 Gordon and Howell report on higher education, which emphasized the importance to management practitioners of understanding human behavior. The behavioral science school has contributed to the study of management through its focus on personality, attitudes, values, motivation, group behavior, leadership, communication, and conflict, among other issues. Some of the major contributors to this school include Douglas McGregor, Chris Argyris, Frederick Herzberg, Renais Likert, and Ralph Stogdill, although there are many others. The quantitative school focuses on improving decision making via the application of quantitative techniques. Its roots can be traced back to scientific management. Management science (also called operations research) uses mathematical and statistical approaches to solve management problems. It developed during World War II as strategists tried to apply scientific knowledge and methods to the complex problems of war. Industry began to apply management science after the war. George Dantzig developed linear programming, an algebraic method to determine the optimal allocation of scarce resources. Other tools used in industry include inventory control theory, goal programming, queuing models, and simulation. The advent of the computer made many management science tools and concepts more practical for industry. Increasingly, management science and management information systems (MIS) are intertwined. MIS focuses on providing needed information to managers in a useful format and at the proper time. Decision support systems (DSS) attempt to integrate decision models, data, and the decision maker into a system that supports better management decisions. This school focuses on the operation and control of the production process that transforms resources into finished goods and services. It has its roots in scientific management but became an identifiable area of management study after World War II. It uses many of the tools of management science. Operations management emphasizes productivity and quality of both manufacturing and service organizations. W. Edwards Deming exerted a tremendous influence in shaping modern ideas about improving productivity and quality. Major areas of study within operations management include capacity planning, facilities location, facilities layout, materials requirement planning, scheduling, purchasing and inventory control, quality control, computer integrated manufacturing, just-in-time inventory systems, and flexible manufacturing systems. The systems school focuses on understanding the organization as an open system that transforms inputs into outputs. This school is based on the work of a biologist, Ludwig von Bertalanffy, who believed that a general systems model could be used to unite science. Early contributors to this school included Kenneth Boulding, Richard Johnson, Fremont Kast, and James Rosenzweig. The systems school began to have a strong impact on management thought in the 1960s as a way of thinking about managing techniques that would allow managers to relate different specialties and parts of the company to one another, as well as to external environmental factors. The systems school focuses on the organization as a whole, its interaction with the environment, and its need to achieve equilibrium. General systems theory received a great deal of attention in the 1960s, but its influence on management thought has diminished somewhat. It has been criticized as too abstract and too complex. However, many of the ideas inherent in the systems school formed the basis for the contingency school of management. The contingency school focuses on applying management principles and processes as dictated by the unique characteristics of each situation. It emphasizes that there is no one best way to manage and that it depends on various situational factors, such as the external environment, technology, organizational characteristics, characteristics of the manager, and characteristics of the subordinates. Contingency theorists often implicitly or explicitly criticize the classical school for its emphasis on the universality of management principles; however, most classical writers recognized the need to consider aspects of the situation when applying management principles. The contingency school originated in the 1960s. It has been applied primarily to management issues such as organizational design, job design, motivation, and leadership style. For example, optimal organizational structure has been theorized to depend upon organizational size, technology, and environmental uncertainty; optimal leadership style, meanwhile, has been theorized to depend upon a variety of factors, including task structure, position power, characteristics of the work group, characteristics of individual subordinates, quality requirements, and problem structure, to name a few. A few of the major contributors to this school of management thought include Joan Woodward, Paul Lawrence, Jay Lorsch, and Fred Fiedler, among many others. Management research and practice continues to evolve and new approaches to the study of management continue to be advanced. This section briefly reviews two contemporary approaches: total quality management (TQM) and the learning organization. While neither of these management approaches offer a complete theory of management, they do offer additional insights into the management field. Total quality management (TQM) is a philosophy or approach to management that focuses on managing the entire organization to deliver quality goods and services to customers. This approach to management was implemented in Japan after World War II and was a major factor in their economic renaissance. TQM has at least four major elements. Employee involvement is essential in preventing quality problems before they occur. A customer focus means that the organization must attempt to determine customer needs and wants and deliver products and services that address them. Benchmarking means that the organization is always seeking out other organizations that perform a function or process more effectively and using them as a standard, or benchmark, to judge their own performance. The organization will also attempt to adapt or improve the processes used by other companies. Finally, a philosophy of continuous improvement means that the organization is committed to incremental changes and improvements over time in all areas of the organization. TQM has been implemented by many companies worldwide and appears to have fostered performance improvements in many organizations. Perhaps the best-known proponent of this school of management was W. Edwards Deming. The contemporary organization faces unprecedented environmental and technological change. Thus, one of the biggest challenges for organizations is to continuously change in a way that meets the demands of this turbulent competitive environment. The learning organization can be defined as one in which all employees are involved in identifying and solving problems, which allows the organization to continually increase its ability to grow, learn, and achieve its purpose. The organizing principle of the learning organization is not efficiency, but problem solving. Three key aspects of the learning organization are a team-based structure, empowered employees, and open information. Peter Senge is one of the best-known experts on learning organizations. Daft, Richard L. Management. 7th ed. Australia: Thomson/South-Western, 2005. Fayol, Henri. General and Industrial Administration. London: Sir Issac Pitman & Sons, Ltd., 1949. Griffin, Ricky W. Management. 8th ed. Boston: Houghton Mifflin Company. Lewis, Pamela S., Stephen H. Goodman, and Patricia M. Fandt. Management. 2nd ed. Cincinnati: South-Western College Publishing, 1998. Locke, Edwin A. "The Ideas of Frederick W. Taylor: An Evaluation." Academy of Management Review 7, no. 1 (1982): 14–24. O'Connor, Ellen S. "The Politics of Management Thought: A Case Study of the Harvard Business School and the Human Relations School." Academy of Management Review 24, no. 1 (1999): 117–131. Robbins, Stephen P., and Mary Coulter. Management. 6th ed. Upper Saddle River, NJ: Prentice Hall, 1999. Senge, Peter. The Fifth Discipline: The Art and Practice of Learning Organizations. New York: Doubleday/Currency, 1990. Warner, Malcolm. "Organizational Behavior Revisited." Human Relations 47, no. 10 (1994): 1151–1164. Wren, Daniel. The Evolution of Management Thought. 3rd ed. New York: John Wiley and Sons, 1987.
the write up is very informative and objective in its analysis. it is wide ranged as it focuses on all the schools of management thought that are generally considered to be of use to the modern managers. although the adminstrative school was discussed objectively, it would have been informative for us to know all the 14 principles of h. fayola as well as a general discussion comparing and contrsating the adminstartive school and the scientific school. This is just the kind of information i've been searching for... specific and straight to the point. Thanks. Managament depends on how a person analyzes the human behavior and how successful he is overcoming these behaviors. I need your sugestion/help, How can I answer a question which say "Explain the quantitative perspective and Discuss the applicability/implication of that perspective with the contemprary world?" I hope you will help me.